We know that we have been blasting you with a lot of exciting packaging updates but believe it or not, we aren’t done with our news! Along with our boxes, we’re adding inserts with product description information, INCI labels, and how-to-use information. This way, all of the information doesn’t have to be listed on the box or the label and we can grow in a way that is compliant with governmental regulations all over the world. Just like the hunt for sustainable labels and boxes, the process of creating our box inserts and new marketing materials was a long-term project for us in terms of design, information to include, and finding the right company to work with. We wanted to make sure that we chose a company that could offer sustainable products and that we can partner with on a long-term basis—it’s really important to us that we create relationships with the companies we work with because we focus on creating relationships that last. We found Eco-Friendly Printer through (what else?) a google search and knew we wanted to work with them as soon as we spoke with Greg, the founder. He is lovely to work with, eager to help with our sustainability goals, and easy to create with—just the kind of partner we like. Eco-Friendly Printer is transparent and hyper focused on being environmentally-friendly. This isn’t a band-wagon type of focus on their carbon footprint either. This is a generation’s (they’re celebrating 26 years!) worth of environment-first thinking. Greg tells this story that he was watching his kids celebrating Earth Day in middle school, thinking about the future and decided right then and there to make Eco-Friendly Printer and to play his part in preserving the Earth for future generations. Eco-Friendly Printer (FSC) is certified by the Forest Stewardship Council (FSC) because they have taken steps to responsibly manage the world’s forests all the way through the supply chain and they go even further when they choose which paper mills they work with. Greg has been in business for so long as a printing company and he is using such cutting edge eco-friendly business practices, paper mills with similar sustainability goals seek him out. Because they’re FSC certified, EFP only works with mills that are also FSC certified, which means that they use at least 30% post consumer waste for all of their paper. Greg also goes a step further and prefers to work with companies that are Processed-Chlorine Free (PCF), which means that they offer paper that is bleached with oxygen or hydrogen peroxide instead of the typical chlorine bleach that can be detrimental to native fish and wildlife. Though we’re working with Eco-Friendly Printer to get our finished inserts and marketing materials, different paper supplying companies are supplying paper for the projects. We have decided to work with Domtar for inserts and promo cards and Mohawk Mill for the brochures and pamphlets. Domtar is certified by a few different really great companies including the FSC, the EU Eco-Label, and the Sustainable Forestry Initiative. They outline all of their sustainability goals along with their status and working to continually improve their efforts toward social responsibility in their approach to forest management. When we spoke with Greg, he couldn’t have rated Mohawk Mill any higher. Just like every other company, Mohawk is FSC certified and they strive to be as low-impact as possible. All of their papers are made with wind power and they focus on using the highest percentage of post-consumer waste as possible—often this is 100%. They are 100% PCF and the water used to create this paper is treated and returned to the river cleaner than when it was received. They take steps to plant new trees and care for the soil in the forests that they use. 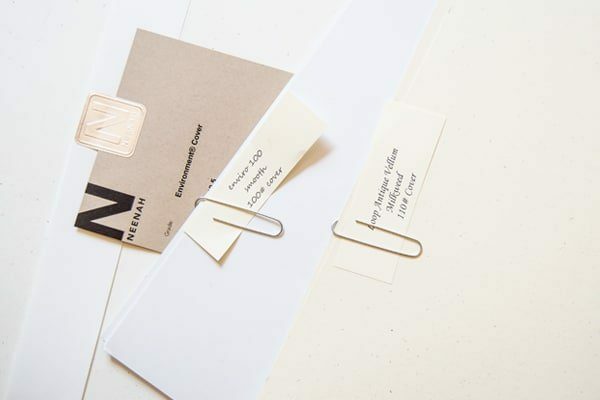 After we learned all of this information about Eco-Friendly Printer and the paper mills they’re working with, we were thrilled to start working toward finding a solution for our inserts, pamphlets, cards, and brochures—we want to use the same company for all of our paper materials. For the informational inserts, we’re using a paper that is 30% post-consumer waste. They will have product information including ingredients, how to use information, our Wild. Beautiful. process, and other relevant information about our company. You’ll see those inside all of our full-size boxes and travel kits. As you know, we absolutely love to send little cards with extra information on them. EFP and Domtar are working on our new postcards too. Like our inserts, our postcards are made of 30% post-consumer waste and they will come with gifts along with being offered to customers at events and in store locations. There are stores all around the world that carry our brand and up until now, we haven’t been able to offer them information to provide to their customers to look at and take home. Our pamphlets are going to change all of that and they’re 100% post-consumer waste and guaranteed processed chlorine free. Many of you have asked us about our brochures and for the past year or two we have been working on updating our design, ingredients, and adding new products to our roster. These are a thicker booklet with a lot of information and we’re proud to announce that these will also be 100% post-consumer waste and processed chlorine free. We’re thrilled that we’re able to tout being even more sustainable and that we’re continually working toward being more and more eco-friendly all the time. Our products are made without unnecessary ingredients or additives and we want our packaging to reflect that too. What do you think of our new paper inserts and marketing materials? I love your new packaging – the paper even feels luxurious, as are your products inside! Thank you for being so transparent and sharing all of this information with us. I have been searching for eco-friendly printing and label solutions for my own packaging needs and will have to look into these trusty manufacturers! Thanks so much and way to go!